I have finally been able to start putting some summer touches in our decor but with all the activities going on here it's been hard to get much done. Today I want to share our summer mantel. I decided to do a Patriotic mantel to celebrate all our summer holidays - Memorial Day, Flag Day, 4th of July and even Labor Day. That way I won't have to worry about changing it again for awhile. And with the goings on around here that's great news. I decided to use a vintage patriotic theme this summer. It fits in with our family room and can be used for all the holidays not just one. I started by placing my burlap wreath that I made a couple years back on the rustic vintage backdrop we made last year. The wreath is such a versatile vintage piece that I love using it in many different areas of the house. I really kept the mantel simple this summer. I started with an empty distressed white frame and placed a patriotic tin star in front of it. To the right of that is a stack of old vintage books lying and a stack standing - no covers and tied with twine. On top of the books I placed three small flags in wooden thread spools that I wrapped with twine, blue and white stripe yarn, and red and white baker's twine. I purchased the flags at Dollar Tree. On the right side is an old distressed white frame that I placed a scrapbook paper flag in. I made this from three different scrapbook papers I had that I glued on some chipboard and then distressed it with distressing ink. I then taped it in the frame. Next to that is a chalkboard I made from an old picture we had. I left it blank here for now but can write whatever I decide on for each holiday. I am thinking F-R-E-E-D-O-M will be the word I add at this time. So there you have it. A very simple and quick vintage mantel to get us through all the busyness of the summer season. And... not a lot of work because I already had everything I used. I am loving the vintage patriotic feel of it. Now to get a few more things done before summer is over - because it is going fast! What have you done? 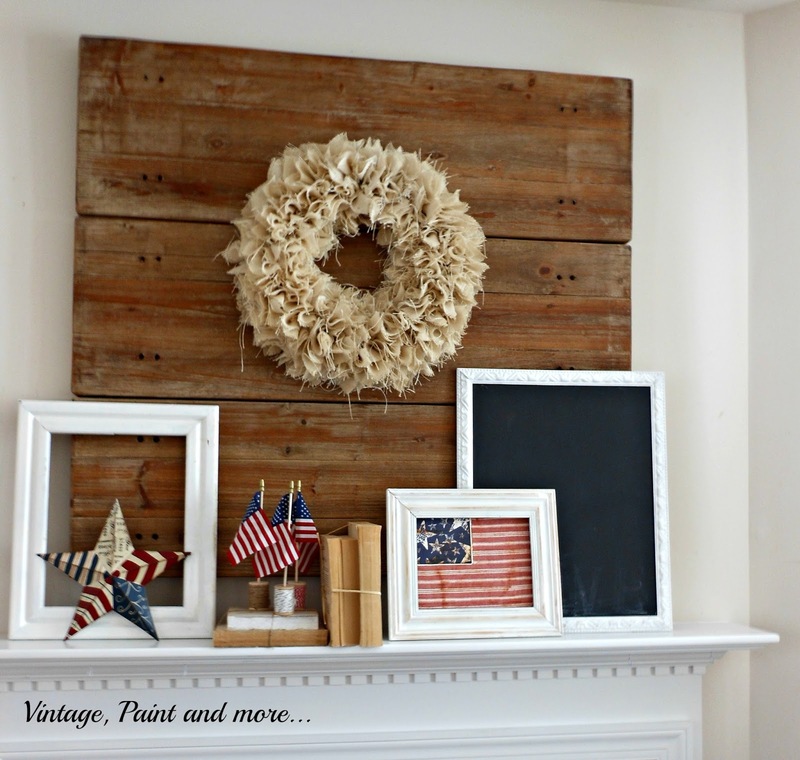 Do you do a summer mantel or do you do a patriotic one that can span the summer months? Would love to hear about what you do in the comments below. If you want to make sure you don't miss any of my projects just sign up for my emails in the Hello bar at the top of this post. I will be joining the link parties listed on the Where I Party page. 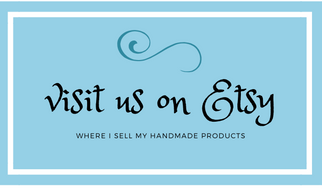 Please go by and visit - you will find some great inspiration and lots of creativeness at each one. 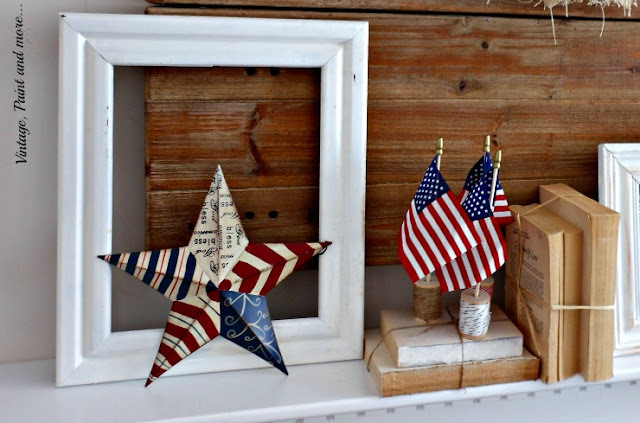 I love the twine/spools for the flag holders ~ great idea! Thank you so much Megin. And thank you for hosting each week. Thank you so much Bethany - I love to decorate mantels when I have the time to do it. Thank you for stopping by. This looks great! I love how it has a patriotic theme but it's toned down with smaller accents of red, white and blue! Love it! Thank you. I love mixing color with my vintage decor and especially around specific holidays. Thank you Theresa. I think that wreath has taken up residency there. I just can't seem to move it from that spot. Thank you Jazmine. The chalkboard is just an old picture that I painted the glass with black chalkboard paint. A very easy project that takes minutes to have something fun. This is gorgeous! I love the simple and rustic feel to it. I am never one to go all out for the 4th of July because I have always thought it is just a few days kind of thing. But, this can work so well all summer long. I love this! Thank you Emily. I like doing a little patriotic decor here and there because it can cover all the holidays of the summer. I don't go way out though either. This is sooo adorable! I wish I had a mantle! Thank you Alicia - you can always use a shelf in your home and pretend it's a mantel. That would be a fun one for sure. Love it!!! I love how you displayed the flags in the spools...so cute! Thanks Tammy. I have had those spools for some time and finally found something to use them for. Happy accidents are the best. Love it! Putting the flag in the frame was a great detail, really sweet! I am also loving that wood planking backdrop. Thanks so much Christine. I really am in love with that plank backdrop also. I am so glad he found those shelves - they were perfect. I love your patriotic mantel. I like the weathered wood and rustic charm with the crisp white frames. Great 4th of July decor! Thank you so much Julie. I love using white in my vintage decor. Thank you for stopping by. 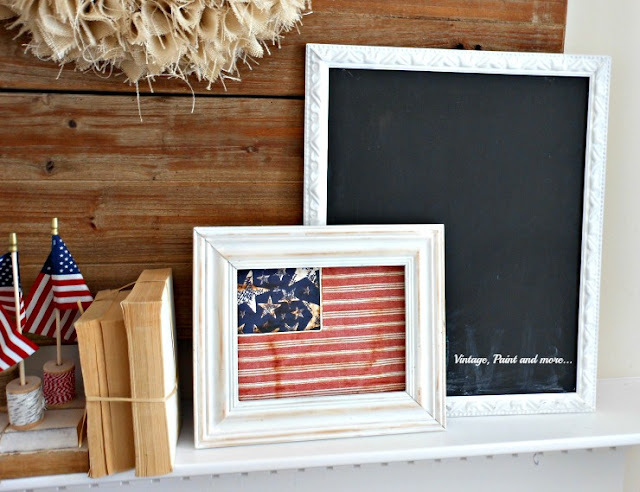 I love using old books in decor, it looks very patriotic and fabulous!! 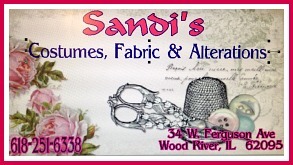 Thank you Jodi - I love using old books also and find I put them in most of my vignettes. What a beautiful yet simple mantel. I love it Thanks for linking at the #HomeMattersParty this week and hope you will come back next weekend to link up again. Thank you so much Melissa for stopping by and thank you for the great party. Thank you so much Dee and thanks for the great party. Simplistic beauty Cathy! I have always loved that backboard you made and your wreath. Thanks for sharing with SYC. Thank you so much Jann. The backboard has made all the difference in the world with our mantel wall. Thank you for stopping by. I need to do this next summer, because really... the summer is full of patriotic holidays. I really like your wooden backdrop and the burlap wreath, plus leaving the chalkboard blank so you can write different phrases on it is brilliant. I am featuring this on Sunday at 8:00 p.m. central at the Motivational Monday link party! Thank you Carrie. It certainly makes summer decorating so easy. Thank you for the feature I will be stopping by. This was fabulous Cathy! I will feature it today at Home Sweet Home! As usual you create the best mantels ever... I love the whole thing and the palette brings the perfect touch! Thank you so much Camila. I love doing mantels.